Celebrate the little piece of the wide world where your paths met with this commemorative puzzle. Of the 192 countries, millions of cities, and more than seven billion people on the planet, somehow you found each other. Celebrate the little piece of the wide world where your paths met with this commemorative puzzle. Your one-of-a-kind puzzle displays an aerial view of your unique meeting spot covering an area of one square mile. 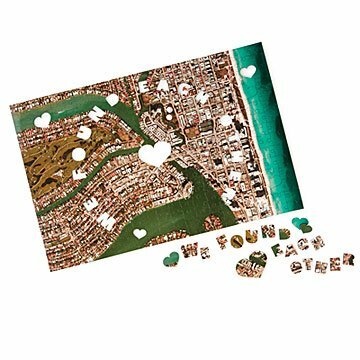 The 300-piece jigsaw puzzle is made in the United Kingdom of thick, quality-crafted wood pieces that snap together to put your romance in perspective. Such a unique gift. I am so excited to give it to my boyfriend. It is very nice quality and love the box it comes in too! The quality of the puzzle is remarkable. I got it for my husband for Christmas but also for the second anniversary of our first date. He absolutely loved it and had a great time putting together. We will frame it and put it up on a wall. Hopefully this is going to be received with, Wow, mom, great gift!!!! I was hoping to receive a bright detailed puzzle as advertised. Instead I received a very dark, visually disappointing image. I was super excited about this product as a valentine's gift to my husband. We met in Hawaii and in my mind everything was gorgeous, but when I got the puzzle, the image was so much farther out than I was expecting and there really wasn't much to the image, except a bunch of black lava and super dark green. So this is no fault of the producer, but rather I wish there was an opportunity to see what the image would look like before making the final purchase. I would not have gotten this had I seen it. A unique gift for a special person. The puzzle is packaged in a nice keepsake box. The pieces are made of high quality wood with cute shapes. There is a secret message at the end of the puzzle's completion. When the gift recipient receives the puzzle it comes with a map of the exact spot you've chosen and a message explaining the puzzle. This is when the tears start, when they realize the thoughtfulness of your gift. Fantastic product. Very well made. This puzzle will be a memory for years to come!! I think it would be a great idea to gift your family with a puzzle featuring where you are going on vacation next year.